Oval Address Plaque with Faux Wicker Border - - 15.5" x 11.5" metal address sign with a distinctive simulated wicker border. Wall mount. Made in USA. 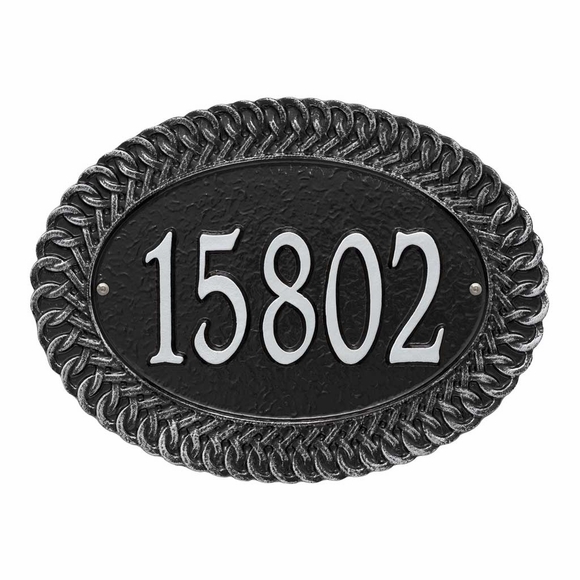 One-line personalized house number sign holds up to five (5) 4" numbers. Final finish on border is applied by hand to accent each beautiful detail. Large image shown in black/silver. Smaller images (from left to right): antique copper, black/gold, black/silver, bronze/verdigris, oil rubbed bronze, and bronze/gold. Dimensions: 15.5"W x 11.5"H x 0.375. Oval Address Plaque features a beautifully detailed simulated wicker border. Made in USA.